Gan Ning (died 215–216), courtesy name Xingba, was a military general serving under the warlord Sun Quan in the late Eastern Han dynasty. 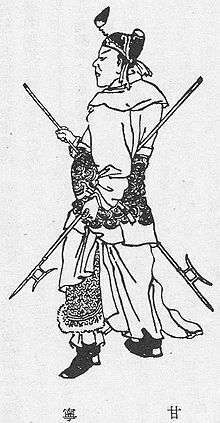 Originally a notorious pirate, he gave up the life of a marauder in the late 190s and became a subordinate of Huang Zu, the Administrator of a commandery in present-day east-central Hubei. Disheartened by Huang Zu's indifferent attitude towards him, Gan Ning eventually left Huang and made his way into Wu territory (present-day eastern and southeastern China), where he found his calling and became a military officer under the warlord Sun Quan. Throughout his years of service under Sun Quan until his death, Gan Ning fought in numerous battles for his lord, including the battles of Jiangxia (208), Red Cliffs (208–209), Xiaoyao Ford (214–215) and Ruxu (217). ↑ de Crespigny, Rafe (2007). A biographical dictionary of Later Han to the Three Kingdoms (23–220 AD). Brill. p. 239. ISBN 978-90-04-15605-0.